Sold in February 2013, the 28 metre sailing Desirade is now back on the market, listed for sale with Alexander Reinsch at dahm international under her new name of El Baile. El Baile is a Farr 92 performance sloop built by Cantieri Sangermani in composite to a design by Bruce Farr and launched in 1998. She is RINA classed and accommodates eight guests in four cabins and is also capable of carrying up to four crew on board. The keel – a bulb and winglet configuration - was built taking advantage of extensive hydrodynamic research experience. 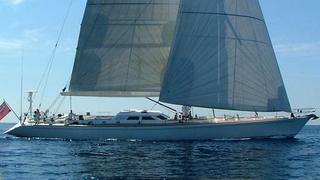 Her powerful four spreader spar and sail plan enables high performance sailing with minimum crew. The yacht offers two cockpits: an aft cockpit with steering position and all control systems plus a spacious guest cockpit amidships, easily sheltered by a Bimini top. Between the cockpits lies an attractive sunbathing and relaxation area. Lying in Ibiza, Spain, El Baile is asking €1.9 million.